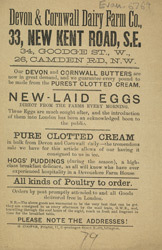 As the 19th century progressed the quality of milk improved. Cows began to be kept in more sanitary conditions and farmers who added water to their milk supplies were prosecuted under the 1872 Adulteration Of Food Act. Railway developments meant that milk could be transported quickly and easily to large cities for the first time. Dairy shops set up marble or slate shelves and counters to help keep the milk cool.